Is it a lot of work? It will depend on how many you monitor. Is it worth it? YOU BET! Is it fun? Oh, yes! One box in your back yard is very easy to monitor once to twice a week. Try with just the one. Install it properly with predator guards, make sure it’s the height easy for you to monitor, and start there. You want the box easy for you to open to check in on the nesting cycles. One box is not a lot of work! Before you know it, you’ll find you’re hooked on caring for bluebirds and other birds that will use it. Just so you know, monitoring the nestbox helps the birds succeed–there just are too many problems that can happen to an unmonitored nestbox. Why put up a nestbox and leave it? That’s not nature. You are installing something man-made. Nature is a natural cavity that cannot be monitored by humans–the way it used to be over a century ago before snags and dead trees with existing cavities existed and were not removed. Though we still have edges of natural woods the bluebirds and other cavity-nesters can use made by woodpeckers, they still need our help due to other reasons other than loss of habitat and cavities made by nature. I am a member of VSO, NABS, VBS, TXBS, and the NCBS. These are the methods and protocol I follow on my own bluebird trail. The information below is extracted from the following websites and I highly recommend these monitoring protocols when I train others how to monitor even one nestbox. For those interested in bluebirding, I highly recommend joining NABS and your State’s affiliate bluebird club for guidance in your locale! Have fun, learn, and enjoy your cavity nesting birds using them …. AND bluebirds! This gal was used to my box checks. She let me open the box and look at her eggs without flying out of the nestbox. She trusted me–part of the joys of monitoring is knowing you are not spooking the birds too much. Not all are like this. This one was particularly friendly and patient with my presence. All boxes will be erected on poles, using predator guards on the poles for snakes, and wire noel guards on the boxes to discourage cats, raccoons and squirrels. No perch will be put on the outside of the box. These only enable predators to have easier access to the chicks and eggs. All boxes will be inspected prior to the nesting season and the boxes will be cleaned and/or repaired as necessary. Boxes will be monitored once per week during the period of April through August. If you are monitoring a bluebird trail with other monitors, monitoring will occur during the same three-day period each week (i.e. Sat/Sun/Mon). After the young fledge, the box will be cleaned out in preparation for the next nesting attempt. Each fall boxes will be winterized for use by birds as winter shelters. 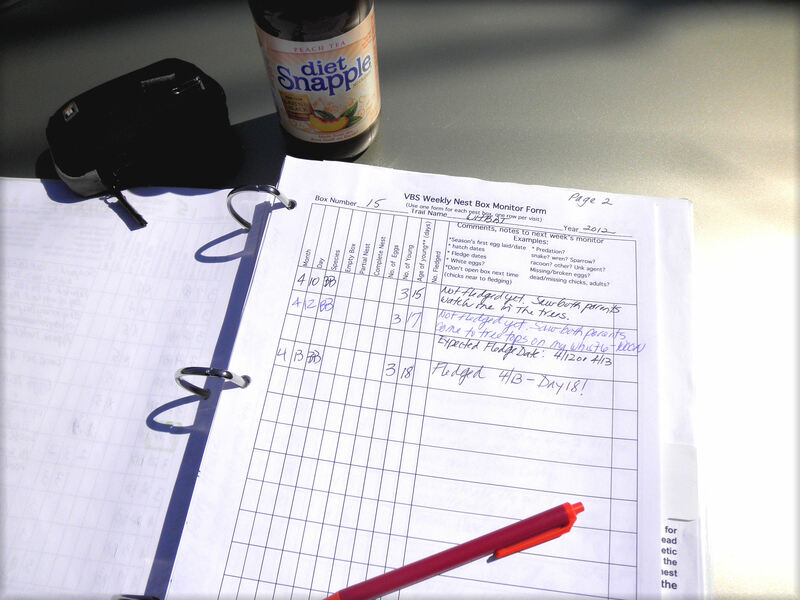 The most gratifying part of notekeeping is…..writing FLEDGED! Monitoring Bluebird Nest Boxes – Why? 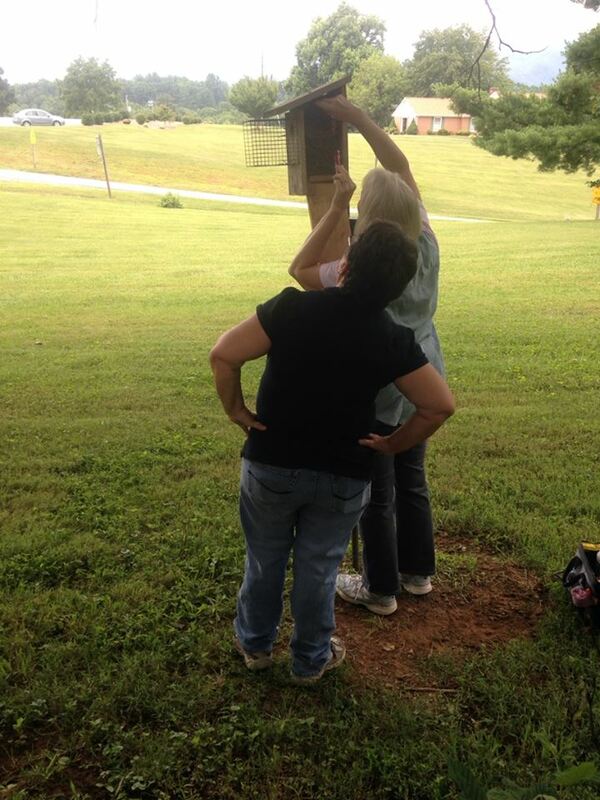 It is very important that bluebird nest boxes be actively monitored (checked) at least once a week. 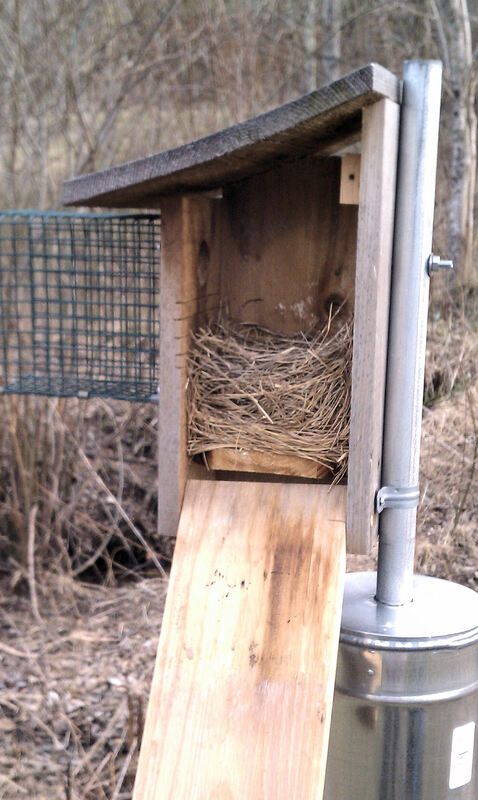 Doing so increases the chances of success for bluebirds using the box and also is valuable for determining population trends. A box that is not monitored may be more harmful than helpful to bluebirds. All bluebird boxes should be built so that they can be opened either from the side, front, or top. Monitoring nest boxes will alert you to problems the birds may be having with blowfly parasitism. Uncontrolled, the larvae of this species may weaken or possibly even kill the nestling bluebirds. If you identify larvae in the nest, you should replace all the nest material with dried lawn clippings in a shape similar to that of the original nest. This will increase the chance that the chicks will survive. Many bluebird enthusiasts replace all nests holding chicks periodically even before the blowfly larvae are visible. You should also replace any nest with young birds that has been saturated following rainfall. This is especially important during cold periods. Being aware of what species is using the box is also beneficial. Bluebird societies would like you to monitor and report all species using your nest boxes, not just bluebirds. Species such as bluebirds, tree swallows, house wrens, and chickadees are all native and beneficial birds. Mail survey forms submitted at the end of the nesting season allows the identification of population trends in each species. House (English) sparrows and European starlings are non-native species introduced from Europe and their aggressive seizure of cavity nest sites is the main reason for the rarity of bluebirds today. Starlings nest in many of the natural nest sites but can be excluded from nest boxes by only using 1 1/2 or 1 9/16 inch entrance holes. 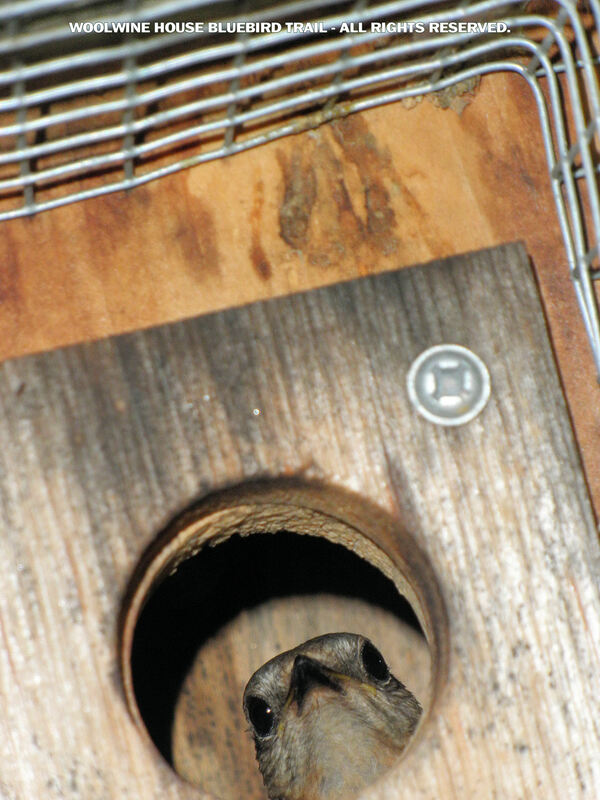 House sparrows can readily enter bluebird nest boxes and frequently kill bluebirds, destroy their eggs, or drive them from their nests. At no time should they be allowed to successfully nest in bluebird boxes. Doing so will increase the house sparrow population and further reduce the number of the bluebirds. After any nesting effort has ended, either due to nest failure or successful fledging of the young, the nest should be removed from the box. 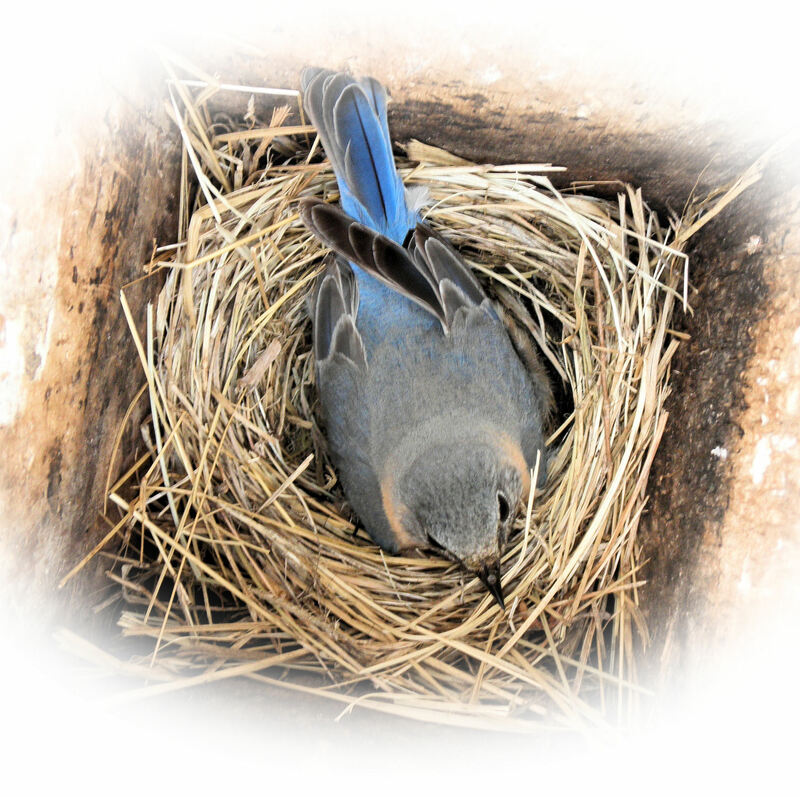 If a bluebird nest was successful, re-nesting in the same box will be encouraged if the first nest is removed. This should be done when all chicks have left the nest. Whenever you monitor a box you should determine what species is using it by examining the nesting material and eggs. You should record the date, and the number of eggs or young that you have observed. Knowing when the eggs where laid will help you determine if they are infertile, or when they should hatch and when the young would be expected to leave the nest. 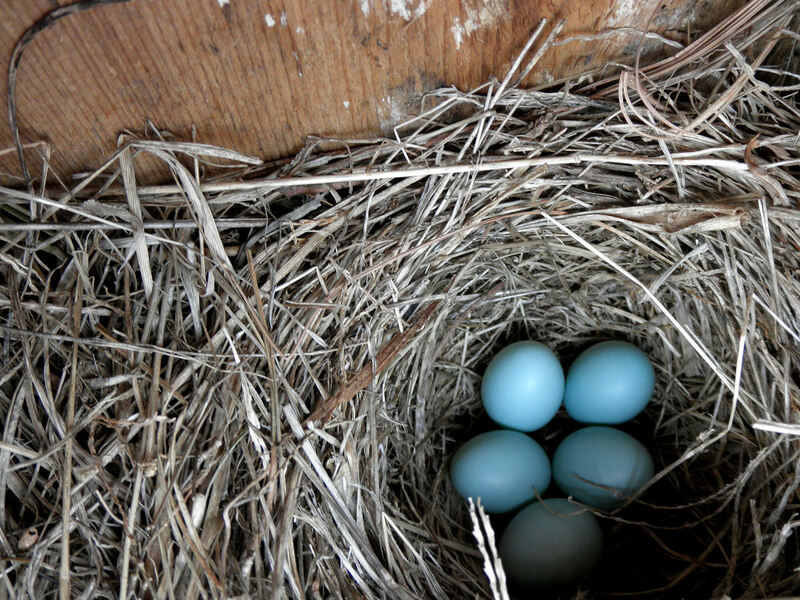 In the case of bluebirds, the eggs are laid one each day until the entire clutch is complete. Incubation will then begin and will last approximately 13-14 days. After hatching the chicks will remain in the nest for 17-18 days. Your monitoring should be limited to viewing from a distance after the 13th day or the chicks might fly from the box prematurely.